The virulence of Hurricane Matthew and the size of its wind field has prompted officials with Florida’s Turnpike Enterprise to close the service plazas along Florida’s Turnpike. Nearly all plazas were closed by 7:00 p.m. Eastern Daylight Time, officials wrote in a news release. Only The Okahumpka Service Plaza was left off the list of closures. Hurricane Matthew’s forecast track brings it along Florida’s coast late Thursday night and into Friday morning. Transportation department officials have announced they are closing service plazas along Florida’s Turnpike in order to protect workers. Authorities announced they would reopen the plazas after the storm was no longer a threat. “All Turnpike Service Plazas will re-open after Matthew passes and all the structures are deemed safe for operation and occupation,” the release read. Editor's note: This page was updated at 9:16 p.m. EDT to reflect the following changes: Shows updated closing times for Turkey Lake and Canoe Creek Service Plazas. Changed first paragraph to show all plazas closed except Okahumpa, near Wildwood. Tolls have been suspended on nearly all of Florida’s toll roads and the mainline of Florida’s Turnpike due to the approach of Hurricane Matthew. Chad Huff, spokesman for the Florida Department of Transportation, announced the toll suspensions late this afternoon in a written release. The suspensions take effect at 8 p.m. Eastern Daylight Time and will remain in effect for the duration of the storm. The latest forecast track for Hurricane Matthew puts just offshore of Florida’s coast by late Thursday and early Friday, but the wind fields extend outward for some 175 miles from the center, according to forecasters. Florida’s Turnpike Mainline, from Exit 2X in North Miami Beach/Miramar, north to the mainline terminus at Wildwood’s Exit 309. The Beachline Expressway, between Interstate 4 in Orlando and US 1 in Brevard County. The Polk Parkway in Lakeland. The National Hurricane Center’s 5 p.m. hurricane advisory shows the track of Matthew has jogged back to the west, putting the storm just offshore of Stuart by Friday morning. With the windfield on Hurricane Matthew extending outward about 175 miles from the center, even an offshore storm is likely to cause extreme high winds on approach, making travel hazardous beginning around midday Thursday, according to forecasters. Tolls will remain suspended until after the storm passes and officials have assessed damage on the roadways, Huff said. The track of Hurricane Matthew saw the storm clear the island nation of Cuba during the early morning hours today, as the storm set its sights on the Bahamas and, next, Florida. Forecasters have downgraded the storm to a category 3 hurricane, but no further weakening is expected. In fact, forecasters believe the system will strengthen some as it traverses the Bahamas, following the path of least resistance through the island nation. By Thursday morning, the storm is expected to be off the coast of Florida. Hurricane Matthew is expected to turn through the Bahamas today and strike along the coast of Florida on Thursday, without making landfall. Graphic from the National Hurricane Center. Because of that track, influenced by a high-pressure ridge in the Atlantic, Florida’s east coast is now, largely, under a hurricane warning. Those warnings went up late Tuesday night, only hours after the east coast had been put under tropical storm and hurricane watches. The current hurricane warning area covers the Florida coastline from Golden Beach, in Miami-Dade County, to Sebastian Inlet, at the north end of Indian River County. Hurricane watches are in effect from the inlet north to Fernandina Beach, adjacent to Jacksonville. Tropical storm warnings are in effect for Miami-Dade County and portions of the upper Florida Keys. State transportation officials are expected to make a decision today about whether to suspend tolls on Florida’s Turnpike. It is unclear how soon such a decision could be made; however, forecasters predict tropical storm conditions will begin to impact the South Florida coast by mid Thursday morning, with conditions deteriorating throughout the day. It is not uncommon for authorities to suspend tolls and change travel directions on toll roads and other highways to accommodate evacuations. Hurricane warnings were issued late Tuesday night for most of Florida’s east coast, from Golden Beach, on the north edge of Miami-Dade County, north to the Sebastian Inlet in Indian River County. The hurricane watch area extends north of Sebastian to the border of Volusia County and Flagler County, just north of Daytona Beach. A hurricane warning means hurricane conditions are likely within the warning area within the next 36 hours. A hurricane watch means conditions may impact the watch area within 48 hours. Hurricane Matthew, weakened slightly from its encounter with the eastern tip of Cuba, remains a category 4 hurricane. Florida’s Turpnike, one of the main evacuation routes for South Florida, in the event of a direct impact, or even a glancing blow, is well inside the warning area. Most of its southern leg, from Fort Pierce, in St. Lucie County, to the start of the Homestead Extension in Miramar, are only a few miles from the coast. Much of that area is now likely to be impacted by high tropical-storm force winds and, potentially, hurricane force winds, according to the latest forecasts. Hurricane-force gusts are likely, in any case. Florida’s Turnpike Enterprise and the Florida Department of Transportation have already been ordering construction crews to tied down equipment at construction sites. Lane barricades and barrels were ordered removed Tuesday night to prepare for added traffic. The decision to suspend tolls on Florida’s turnpike and elsewhere may come Wednesday, according to Chad Huff, from FDOT. Officials had not made that decision late Tuesday night. The graph, issued by the National Hurricane Center, shows the likelihood of being hit by tropical-storm force winds over the next five days. According to the graph, Florida’s Turnpike is increasingly likely become too dangerous to drive by Thursday. The Beachline Expressway’s eastern-most leg fell within a hurricane watch area Friday evening, as well. The toll road’s length traverses central Florida from Orlando to the eastern end of Brevard County, ending at US-1 in Cocoa, which became part of the watch areas late Tuesday. A spokesman for the Central Florida Expressway Authority, Brian Hutchings, said any decisions about suspending tolls on the Beachline would be issued by the Florida’ governor, not CFX. While Hurricane Matthew has weakened some during its trek across the western tip of Cuba, the storm remains a category 4 hurricane, with winds topping out at 130 miles per hour, according to forecasters at the National Hurricane Center. Hurricane-force winds extend outward 45 miles from the center of the storm, while tropical storm-force winds extend 175 miles from the eye. Officials with Florida’s Department of Transportation said today they do not know whether there will be a need to change traffic patterns on Florida’s Turnpike as a result of Hurricane Matthew. Much of Florida’s east coast and most of the Florida Keys are under either a tropical storm watch or a hurricane watch, after the National Hurricane Center in Miami released its 11 a.m. update today. The National Hurricane Center’s forecast track for Hurricane Matthew clearly puts Florida, and its toll roads, in the danger zone. It is not uncommon for authorities to suspend tolls and route traffic in a specific direction, to accommodate evacuations. However, FDOT spokesman, Chad Huff, said it was too early to know whether a traffic a pattern change would happen or whether tolls might be suspended. Huff said he and other officials were very busy today in the face of Hurricane Matthew’s approach. “We wont’ know that until [Wednesday],” he told TurnpikeInfo.com. Florida’s Turnpike runs through the middle of the peninsula at its north leg, but it turns to the east, just north of the Fort Drum Service Plaza, then runs close to Florida’s east coast, often getting within five miles of the coast. That is close enough to feel the impact of Hurricane Matthew. The storm is projecting hurricane force winds some 60 miles from the center of the storm, and tropical storm force winds extend 185 miles from the center of the storm, according to the NHC. The National Hurricane Center’s forecast for wind speeds over the next five days shows most of Florida’s east coast will confront tropical storm force winds. In Central Florida, where hurricane watches apply along the coastline, up to the Brevard County-Volusia County border, Hurricane Matthew could still create high winds and dangerous rain conditions well inland, affecting the Beachline Expressway, which runs from Interstate 95 west to Orlando. Any decision to alter traffic or suspend tolls on the Central Florida Expressway roads, however, will still come from the Florida governor’s office, said Brian Hutchings, spokesman for the CFX in Orlando. Florida’s governor, Rick Scott, declared a state of emergency late Monday, after the track for Hurricane Matthew shifted considerably to the west. Scott observed that Hurricane Matthew is the most powerful storm to threaten the Sunshine State in nearly a quarter of a century. While a host of hurricanes and tropical storms have hit the state in that time, none has had the potential for such extreme damage as Hurricane Matthew. “If Hurricane Matthew directly impacts Florida, there could be massive destruction which we haven’t seen since Hurricane Andrew devastated Miami-Dade County in 1992,” Governor Scott told reporters Monday. Editor's note: This story has been modified to include the comments of Brian Hutchings from the Central Florida Expressway Authority. New ramps connecting SR 417 to Florida’s Turnpike just south of Orlando will open the morning of May 16, 2016. Construction has completed on three new ramps connecting Florida’s Turnpike with State Road 417, also called the Central Florida GreeneWay, and those ramps are set to open to rush-hour traffic Monday, May 16, 2016, according to Florida’s Department of Transportation. F.D.O.T. made the announcement Thursday afternoon. The new interchange has been under construction, in stages, since late 2013. The first ramps opened in the fall of 2015. Monday’s ramp openings will mark completion of the second stage of the new interchange construction. A final stage, which will complete the last three ramps in the interchange, is set to begin construction later this year, according to the F.D.O.T.’s news release. The new interchange also marks continued expansion of Florida’s Toll-by-Plate program, which is eliminating cash-toll facilities at many interchanges. 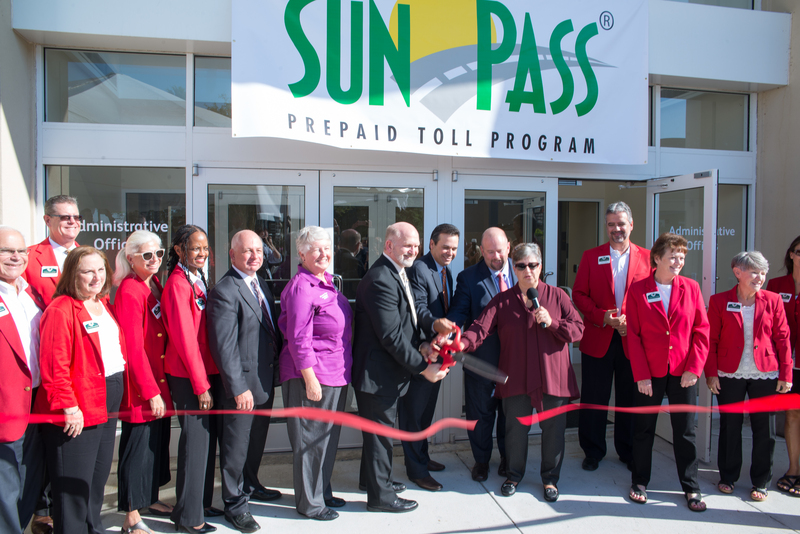 The entirety of Florida’s toll road system is slated to be completely cashless within a few years, following a national trend toward cashless and electronic toll collection, even at bridges and tunnels. F.D.O.T. will open the new ramps to traffic at 6 a.m. on May 16.